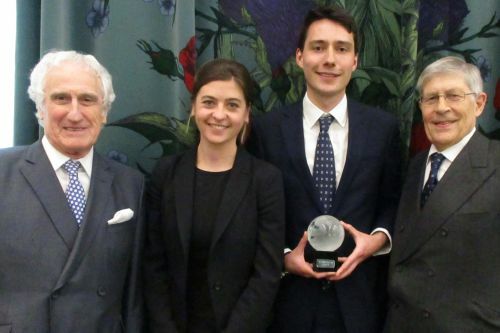 Winner Douglas Grant and runner-up Gemma McNeill-Walsh, have taken top spots in one of the City Law School's rigorous and most competitive events. 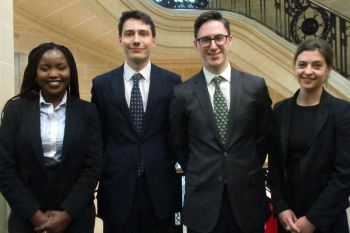 The final of the City Law School's 2018 Senior Mooting Competition took place on 10th May. There were excellent arguments on either side but the winner and runner-up were Douglas Grant and Gemma McNeill-Walsh respectively, who deserve particular congratulations. The event was held at the Supreme Court of the United Kingdom, providing a great opportunity for the finalists to experience their first appearance there as learned counsel. This year's competition commenced in January, with the finalists triumphant in two preliminary rounds before making it to the final. The mooting question was a taxing chancery problem set by Barry Denyer-Green of Falcon Chambers. 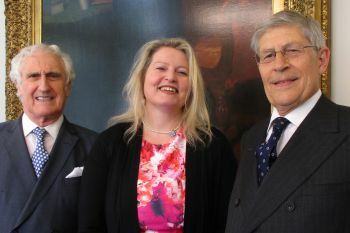 Barry kindly acted as a judge in the final along with the Rt Hon Lord Gill of the same chambers. The finalists were Tadhgh Barwell-O'Connor, Douglas Grant, Blessing Park and Gemma McNeill-Walsh and their sterling efforts were all rewarded with monetary prizes. A number of supporting guests, including some of the competitors' parents, partners and husbands were also in attendance. Two of the finalists were on the Graduate Diploma in Law (GDL) course and two on the Bar Professional Training Course (BPTC). Mooting is a valuable addition to a prospective barrister's CV or application and students should take advantage of what the annual City Law School mooting competition has to offer. Students on all post-graduate taught courses are encouraged to apply for the competition, including those studying part-time. Participants involved in the 2018 competition said it was a great experience for them.